We now have experience with tire tape and recommend it for riders who do not want to work with traditional tubular tire glue. (Also see our Tubular Tire Advice page.) There are two types: Standard (yellow box) and Extreme (orange/red box). We almost always recommend the Extreme because it does much better in sustained braking such as in mountainous conditions. If you are new to tubulars and want more personal help or advice on them please contact us, we are happy to help riders with any level of experience. We mount a lot tubulars tires. We also mount and ship tubular tires mounted, what we call our Race Ready ProgramTM. If you are new to tubulars we recommend starting with them race ready. We sell all the tires and accessories you might need for your wheels. To order, check our Race Ready ProgramTM and contact us. We also appreciate your feedback -- tell us how to make these instructions clear and complete. Warning! Always make sure you are comfortable with and aware of your skill limits in both tire mounting and bike handling. Please test your limits before you commit yourself to a sharp high-speed turn. For safety, always check your tires before you ride. Do this by trying to push your tires off the rim with your thumbs -- they should feel secure! Mounting a tubular tire. For a full description of tubular tire mounting please see the mount section from our tubular tire advice page. This synopsis provides an overview for those interested in using the tape. Prepare the rim. Apply the tape (see below). Put a cardboard scrap on the floor. Put the wheel on the cardboard with the valve hole at the top, mount the tire by carefully putting the tire valve into the valve hole and stretching the tire along the rim toward the floor. Use the floor to backstop and hold the wheel while you stretch the tire downward. 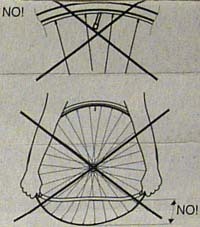 Maintain tension on the tire as you mount. You will need to stretch the whole tire on the wheel to make it fit. Get the tire on straight as you mount it. While still maintaining a good hold on both sides of the tire, lift the wheel off the floor to get the last 6 to 12 inches of tire mounted. Don't let go of your tire -- keep the pressure on! Once mounted, check the base tape of the tire on both sides of the mounted rim. If the tire is straight, there should be an even amount of tire base tape showing all around the tire. You should try to lift and move the tire if you need to straighten it. Take a good look at the unpackaged tape. There are two sides to the tape. One side is uniform and has yellow backing paper. That is the side that goes down on the wheel rim. The other side has a narrow layer visible in the center. That is the side that goes toward the tire. The rim side of the tape is designed to be stickier and as a result remains on the rim when the tire is later removed. This allows you to mount a new tire onto the same tape. Start the Tape at the Valve Hole The inside the yellow Tufo tape box the has pictures offering mounting advice. Here are our interpretations of these pictures. Fig. 1, tells us to start the application of the tape to the rim beginning at the valve hole. We advise that the rim is first cleaned. Note that the stepped or ridged side is outward toward the tire. Fig. 1a, tells us to completely cover the rim up to the valve hole. We stop at the start of the hole. We have not worried about coving the edges of the valve hole. 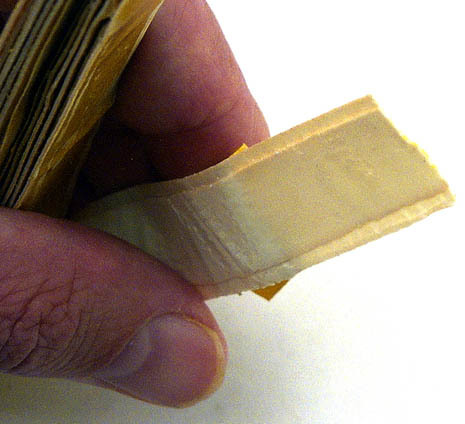 Wet the Tape on the Rim After The tape has been applied to the rim use a damp rag or sponge to moisten the outward tire side of the tape. This makes it less sticky and allows you to place the tire on the tape without fighting the adhesive. You can also first wet the base tape of the tire to give you additional time to get the tire into position before the bond dries. Once the water evaporates the tire is stuck down firmly. Stretch the Whole Tire Fig. 2, tells us to start mounting the tire with the valve at the top. Insert the tire valve and start stretching the tire along the rim as you mount it. Fig. 3, tells us pull the tire all the way round to the bottom. Look at NO! figure number 2 for the consequences of not pulling all the way around. Be Careful NO! #1, says to make sure the tire valve is straight. This requires the valve to be inserted first and as straight as possible. If it is crooked it will wear and cause a flat. NO! #2, says not to delay stretching the tire until you reach the bottom. If you try this you will not be able to make it fit. Pre-stretch the tire and start stretching from the top top like Fig. 2 and 3. Always test your tires before each ride by trying to push them off the rim with your thumbs.